Background: Metamizole (Dipyrone) is widely used and has effective analgesic, antipyretic, and antispasmodic properties. After oral or intravenous administration, dipyrone is rapidly hydrolyzed to the active moiety 4-methylaminoantipyrine. Aim: The aim of this study was to assess the bioequivalence of 2 oral formulations of Metamizole 500 mg.
Methods: This double blind, randomized, single-dose,2-period crossover study in healthy Indian adult volunteers was conducted at PERD Centre, Ahmedabad. Subjects received Metamizole 500 mg of either test or reference formulation with a washout period of 7 days. After study drug administration, serial blood samples were collected over a period of 24 hours. Plasma concentration of 4-methylaminoantipyrine was measured by pre-validated LC-MS method. Pharmacokinetic (PK) parameters Cmax, Tmax, t1/2, AUC0-t, AUC0-∞, and kel, were determined for test and reference formulations. The formulations were to be considered bioequivalent if the log-transformed ratios of Cmax, AUC0-t, and AUC0-∞ were within the predetermined bioequivalence range of 80% to 125%. Results: A total of 14 subjects were enrolled. No significant differences were found based on analysis of variance, with mean values and 90% confidence intervals of test/reference ratios for these parameters as follows: Cmax, 18.24 versus 18.44 μg/mL (92.68 - 106.61); AUC0-t, 92.97 Versus 91.37 μg.hr/mL (89.49 - 113.09); and AUC0-∞, 96.64 Versus 94.65 μg.hr/mL (92.31 - 111.63). INTRODUCTION:Dipyrone (metamizole) is widely used and has effective analgesic, antipyretic, and antispasmodic properties. The drug is indicated for severe pain conditions, especially those associated with smooth muscle spasm or colics affecting the gastrointestinal, biliary, or urinary tracts 1. Moreover, dipyrone is useful for treatment of cancer pain and migraine as well as fever refractory to other treatments. Dipyrone is a prodrug, and its pharmaco- kinetics has been extensively investigated 2, 3. After oral or intravenous administration, dipyrone is rapidly hydrolyzed to the active moiety 4-methylamino antipyrine (MAA) 4, 5. 4-methylaminoantipyrine has 85% bioavailability after oral administration in tablet form 6. MAA is rapidly and nearly completely absorbed, reaching peak levels within 1-2 h 2. MAA is further metabolized to 4-formylaminoantipyrine (FAA) and 4-aminoantipyrine (AA), which is acetylated to 4- acetylaminoantipyrine (AAA). Because the analgesic effect of dipyrone correlates with the time course of 4-methyl aminoantipyrine concentrations in serum 2, 7, pharma- cokinetic parameters pertaining to this active metabolite are appropriate for assessing the bioequivalence of dipyrone formulations. Most of a dose is excreted in the urine as metabolites. The aim of this study was to compare the bioavailability of Restriva 500 mg tablets (Metamizole 500 mg), Manufactured by Troikaa Pharmaceuticals Ltd, Ahmedabad, India with Neo-Melubrina 500 mg tablets (Metamizole 500 mg), Manufactured by Aventis Pharma, Gautemala in healthy, adult, male volunteers. MATERIAL AND METHODS: This study was carried out at B.V. Patel Pharmaceutical Education and Research Development centre, Ahmedabad. All the subjects provided written informed consent to participate in the study prior to enrolment and were free to withdraw at any time during the study. The study was approved by the Institutional Ethics Committee (IEC) and was conducted in accordance with good clinical practice and the declaration of Helsinki. Design: The study was designed as Double blind, Balanced, Randomized, Two- Treatment, Two-Sequence, Two Period, Single Dose, Crossover Bioequivalence study with 7 days washout period. The volunteers were administered one of the two study drugs after an overnight fast. The dose administration was performed as per the randomization schedule generated at B.V. Patel PERD Centre, Ahmedabad. Subjects received single oral dose of the test formulation (Metamizole 500 mg, manufactured by Troikaa Pharmaceuticals Ltd. India) and reference formulation (Metamizole 500 mg, Manufactured by Aventis Pharma, Gautemala). Blood sampling: A total of 15 blood samples were collected during each period. The blood samples were collected in pre-labeled (mentioning project no., subject no, period, sampling time point and sample no.) glass tube using heparin rinsed syringes. 6 mL of blood samples were withdrawn at pre-dose and 0.25, 0.5, 0.75, 1.0, 1.5, 2.0, 3.0, 4.0, 5.0, 6.0, 8.0, 10.0, 12.0 and 24.0 hrs following drug administration in each period. The plasma from blood sample was separated by centrifugation at 4000 rpm for 07 minutes at 4°C. After centrifugation, plasma separated from blood samples was stored at –20±5°C for interim storage and then at –70±5°C until analysis. Method of Analysis: For the bioequivalence study of metamizole, the assay of 4-methylaminoantipyrine was done as follows: The drug was extracted from plasma using organic solvent and injected in to LC-MS system to determine the concentration of unknown sample. Extraction method was as follows: 100 μl plasma was diluted with 300μl water, 100μl of IS (internal standard) was added and vortexed, followed by addition of 100 μl of 0.1N ammonium hydroxide. This was then extracted with 4ml Ethyl acetate. The organic fraction was separated, evaporated and reconstituted in 50μl of mobile phase and injected 20 µl. The Analyst software version 1.3.2 was used for evaluation of the chromatograms. The calibration curve standards and quality control standards were prepared with chromatographically screened plasma blanks, which were found to be free from significant interferences at the retention times of drug and internal standard. The CCs and QCs were prepared and the samples were analyzed and evaluated according to the procedure described above. The linearity, precision and accuracy were within limits. The linearity range was 0.2 µg/ml to 10 µg/ml. 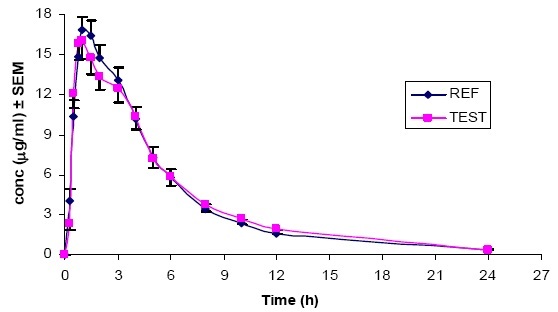 Pharmacokinetic and Statistical Analysis: Maximal plasma concentration (Cmax) and time to reach the peak concentration (Tmax) were obtained directly by the visual inspection of each subject's plasma concentration-time profile. The slope of the terminal log-linear portion of the concentration-time profile was determined by least-squares regression analysis and used as the elimination rate constant (Kel). The elimination half-life was obtained from the formula, t1/2 = ln(2)/ Kel. The AUC0-t from time zero to the last quantifiable point (Ct) was calculated using the trapezoidal rule and the extrapolated AUC from Ct to infinity (AUC0-∞) was to be determined as Ct/ Kel. The area under the plasma concentration-time from 0 to infinity (AUC 0-∞) was calculated as the sum of the AUC0-t plus the ratio of the last measurable concentration to the elimination rate constant. Analysis of variance (ANOVA) was performed (α=0.05) on log transformed Cmax, AUC0-t, and AUC0-∞. The formulations were to be considered bioequivalent if the log transformed ratios (test/reference) of Cmax, AUC0–t, and AUC0–∞ were within the predetermined bioequivalence range of 80% to 125%. Safety and Tolerability: General clinical safety was assessed via physical examinations and vital signs conducted at screening and at the end of the study. Clinical laboratory tests and ECGs were also conducted at screening, before dosing within each treatment period, and at the end of the study. Adverse events were assessed for severity and relationship to treatment through out the study. RESULT AND DISCUSSION: All the 14 subjects completed the study. 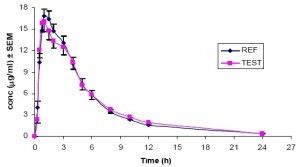 The mean plasma concentration–time curves of two metamizole formulations for 4-methylaminoantipyrine is shown in the figure 1. The mean pharmacokinetic parameters for both formulations are listed in Table 1. The study results revealed that the 2 formulations of metamizole were similar in PK characteristics among these healthy Indian male volunteers. The mean (SD) Cmax values of test and reference formulations for 4-methylaminoantipyrine were 18.24 ±3.34 and 18.44 ±3.57 μg/mL, respectively. Results for the extent of absorption, as determined from mean (SD) AUC0–t and AUC0–∞ values, were 92.97±34.77 and 96.64±34.08 μg/mL/h respectively after administration of the test formulation and 91.37±29.58 and 94.65±30.11 μg/mL/h after administration of reference formulation. In present study mean values of Cmax, AUC0–t, and AUC0−∞ were found higher in comparison with results reported by Suarez-Kurtz G et al 2. Suarez-Kurtz G et al., reported 11.0 μg/mL, 64.2 μg/mL/h and 68.3 μg/mL/h as mean values of Cmax, AUC0–t, and AUC0−∞ respectively after administration of single dose of metamizole 600 mg in Brazilian healthy volunteers. In another study, Asmardi G et al., reported maximum concentration in the range of 7.52 to 22.69 mcg/ml after oral administration of dipyrone 8. The mean (SD) Tmax values of test and reference formulations for 4-methylaminoantipyrine were 1.21 ±0.65 and 1.14 ±0.63 hours. The results for Tmax were consistent with the results (range 1-2) reported by Levy M et al and Volz M et al 3, 9.The mean (SD) t1/2 was 6.99±1.23 hours for the test formulation and 6.79±2.74 hours for the reference formulation which was slightly longer than the t1/2 (4.4 ± 2.8 h) reported by Suarez-Kurtz G et al 2. No significant differences were found based on analysis of variance. The 90% confidence intervals were completely contained within the predefined bioequivalence criteria of 80% to 125% for Cmax and AUC which were considered as primary pharmaco-kinetic parameters (table 2). The 90% confidence intervals for the ratios of Cmax, AUC0–t, and AUC0−∞ were 92.68 - 106.61, 89.49 - 113.09 and 92.31 - 111.63 respectively, meeting the predetermined criteria for bioequivalence. All 14 subjects completed the study. None of the subjects experienced or reported any adverse event, during the entire course of the study. No clinically significant abnormalities were reported in the physical examination, vital signs, ECGs and laboratory results. The post study physical examinations and vital signs were found to be normal and not indicative of any clinical abnormality. CONCLUSION: Since the 90% confidence intervals for Cmax, AUC0-t, and AUC0−∞ were within the interval of 80-125%, it was concluded that both formulations were bioequivalent, according to both the rate and extent of absorption. ACKNOWLEDGEMENTS: We are thankful to Troikaa Pharmaceuticals Ltd., Ahmedabad, for providing the drug samples. We are also grateful to clinical staff of PERD Centre for assistance in the conduct of this bioequivalence study. Hinz B, Cheremina O, Bachmakov J, Renner B, Zolk O, Fromm MF and Brune K: Dipyrone elicits substantial inhibition of peripheral cyclooxygenases in humans: new insights into the pharmacology of an old analgesic. FASEB J 2007; 21(10):2343-2351. Suarez-Kurtz G, Ribeiro FM, Estrela RC, Vicente FL and Struchiner CJ: Limited-sampling strategy models for estimating the pharmacokinetic parameters of 4-methylaminoantipyrine, an active metabolite of dipyrone. Braz J Med Biol Res 2001; 34(11):1475-1485. Levy M, Zylber-Katz E and Rosenkranz B: Clinical pharmacokinetics of dipyrone and its metabolites. Clin Pharmacokinet 1995; 28(3):216-234. Karsten M, Albrecht P, Hans-Ulrich H and Erwin DS: Dipyrone (Metamizole) Metabolites Interfere with HPLC Analysis of Plasma Catecholamines but Not with the Determination of Urinary Catecholamines. Clinical Chemistry 2006; 52:1829-1831. Levy M, Flusser D, Zylber-Katz E and Granit L: Plasma kinetics of dipyrone metabolites in rapid and slow acetylators. Eur J Clin Pharmacol 1984; 27:453–458. Peter S: Medical Applications of Finite Mixture Models. Springer Publisher, First edition 2009. Vlahov V, Badian M, Verho M and Bacracheva N: Pharmacokinetics of metamizol metabolites in healthy subjects after a single oral dose of metamizol sodium. European Journal of Clinical Pharmacology 1990; 38: 61-65. Asmardi G and Jamali F: Pharmacokinetics of dipyrone in man; role of the administration route. Eur J Drug Metab Pharmacokinet 1985; 10(2):121-125. Volz M and Kellner HM: Kinetics and metabolism of pyrazolones (propyphenazone, aminopyrine and dipyrone). Br J Clin Pharmacol 1980; 10(2):299S-308S.